Bjarke Ingels Group have won a competition to convert a Basel warehouse with their design for an extension that will zigzag across the roof like a bolt of lightning. The Danish architects propose to convert the industrial Transitlager building into offices, apartments and galleries. The apartments are to occupy the three new upper floors and will open out onto triangular rooftop gardens. Four storeys inside the existing concrete warehouse will house offices and galleries, facing a new public square proposed by site masterplanners Herzog & de Meuron. Other projects by BIG on Dezeen include a power plant that doubles up as a ski slope and a centre for women's sports - see more projects by BIG here. BIG wins an invited competition to renovate and extend an existing 1960's concrete warehouse situated in a Basel industrial district which is being transformed into an alternative Arts District. Located in Basel’s upcoming Dreispitz neighborhood, which is envisioned as an attractive and inviting urban quarter in Herzog de Meuron's master plan from 2003, the existing 18.000 m2 ”Transitlager” built in the late 1960s is to be renovated and extended by up to 7.000 m2 for residential and commercial purposes. The development is undertaken by St. Gallen -based real estate development company Nüesch Development for the landlord, the Christoph Merian Foundation and investor the UBS (CH) Property Fund – Swiss Mixed ‘Sima’. The winning entry which included engineers Bollinger Grohmann and HL Technik was chosen among proposals from Harry Gugger Studio and Lacaton Vassal among others. The Transitlager’s surrounding industrial area is characterized by the geometries of infrastructures - the intersecting railways, loading docks and turning radiuses that weave through the city and create a puzzle of linear buildings with pointy corners and staggered façade lines into an untraditional and adventurous urban area consisting of galleries, restaurants and creative businesses. The iconic character of the existing Transitlager, its generous surrounding public spaces, and connection to the city’s botanical garden makes the building a natural focal point of the Arts District. By re-programming and extending the former warehouse into a multifunctional series of floors for various uses, BIG proposes a cross breed of art, commerce, working and living. Two distinct buildings on top of each other form a mixed-use hybrid with activity and life 24 hours a day. 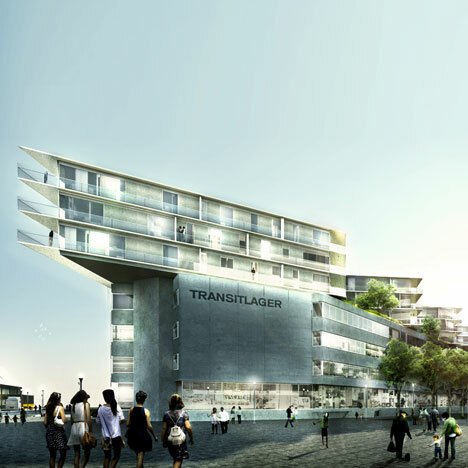 “We propose a transformation of the Transitlager that builds on the industrial logic of the existing building and of the surrounding area. The extension doubles the size of the Transitlager and becomes an opposite twin – based on the same structure, but with a different geometry. The combined building becomes a spectrum of optimal conditions: From open and flexible plans to tailor made units, public programs to private residences, vibrant urban space to peaceful green gardens and from cool industrial to warm and refined. ” Andreas Klok Pedersen, Partner, BIG. The wide dimensions of the former warehouse, the mix of programs, the structural limits and the sun orientation creates a typology that is neither point house nor slab – a folded geometry adapted to the specifics of the existing structure and optimized for daylight and views. The staggered edge and pointy ends echoes the geometries of the industrial buildings of the neighborhood, creating a surprising familiarity with the heterogeneous surroundings.